NYC plays hosts to every weather condition imaginable! From blizzards, torrential downpours and heat waves, this variety of conditions creates a unique and challenging riding climate for cyclists. Last Fall Mishka introduced the Spetsnaz Tech Jacket as an all-purpose, functional jacket against the elements. 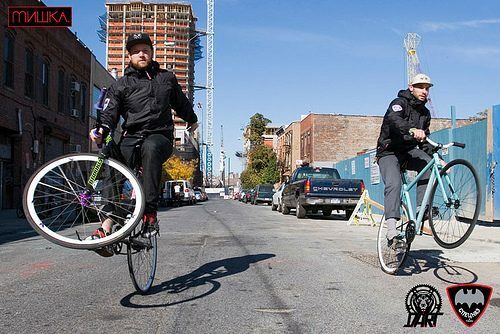 This Fall we went back to the drawing board to up the ante with the Spetsnaz Mark II, creating a better fit the jacket to the needs of NYC’s cycling community! In addition to the already taped seams, the jacket was made waterproof and coated to withstand a whopping 10,000mm of water pressure and treated to not only be wind-proof but also breathable by wicking away sweat your body heat creates. Coupled with undearm arm ventilation zippers, the jacket offers up the perfect comfort control for cyclists plowing through NYC streets. And for those messengering, the jacket features a generous 13″ x 10.5″ back pouch to safely store any and all important documents that need delivering, while keeping your hands and torso free of a cumbersome bag. 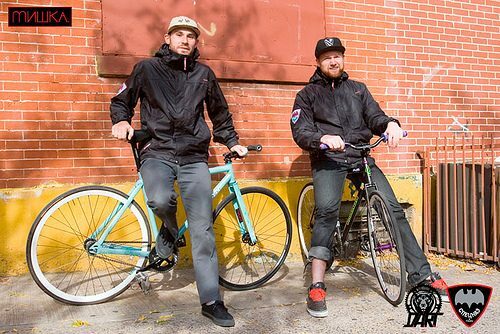 But don’t just take our word for it as we let these jackets get tested by some of NYC’s most dedicated riders. Unfortunately, taking all of these technical features and coupling them with very small production runs results in the unfortunate side-effect of a hefty retail-price. We at Mishka are not oblivious to the fact that this may very well boost the jacket to an unaffordable price for many people whose livelihoods are dependent on their bicycles. We would like to offer a 35% savings on our Spetsnaz II to those out there who can not live without their bicycles and use them as their primary means of transportation.